This article is about the device in heraldry. For the American coin, see Double Eagle. For the French play, see L'Aigle à deux têtes. The double-headed eagle motif appears to have its ultimate origin in the Ancient Near East, especially in Hittite iconography. It re-appeared during the High Middle Ages, from circa the 10th or 11th century, and was notably used by the Byzantine Empire, but 11th or 12th century representations have also been found originating from Islamic Spain, France and the Serbian principality of Raška. From the 13th century onward, it became even more widespread, and was used by the Seljuk Sultanate of Rum and the Mamluk Sultanate within the Islamic world, and by the Holy Roman Empire, Serbia and Russia within the Christian world. 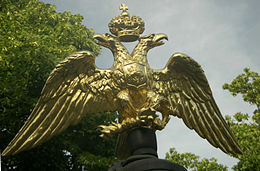 Used during the late Byzantine Empire as a dynastic emblem of the Palaiologoi, it was adopted during the late Medieval to Early Modern period in the Holy Roman Empire on one hand, and in Orthodox principalities Serbia and Russia on the other, representing an augmentation of the (single-headed) eagle or Aquila associated with the Roman Empire. In a few places, among them the Holy Roman Empire and Russia, the motif was further augmented to create the less prominent triple-headed eagle. Polycephalous mythological beasts are very frequent in the Bronze Age to Iron Age pictorial legacy of the Ancient Near East, especially in the Assyrian sphere, and thence adopted by the Hittites. Use of the double-headed eagle in Hittite imagery has been interpreted as "royal insignia". A monumental Hittite relief of a double-headed eagle grasping two hares is found at the eastern pier of the Sphinx Gate at Alaca Hüyük. The early Byzantine Empire continued to use the (single-headed) imperial eagle motif. The double-headed eagle appears only in the medieval period, by about the 10th century in Byzantine art, but as an imperial emblem only much later, during the final century of the Palaiologos dynasty. In Western European sources, it appears as a Byzantine state emblem since at least the 15th century. An exceptional medieval depiction of a double-headed eagle in the west, attributed to Otto IV, is found in a copy of the Chronica Majora of Matthew of Paris (Corpus Christi College, Cambridge, Parker MS 16 fol. 18, 13th century). After the fall of Byzantium the use of two-headed eagle symbols spread to Grand Duchy of Moscow after Ivan III's second marriage (1472) to Zoe Palaiologina (a niece of the last Byzantine emperor Constantine XI Palaiologos, who reigned 1449-1453), The last prince of Tver, Mikhail III of Tver (1453–1505), was stamping his coins with two-headed eagle symbol. The double-headed eagle remained an important motif in the heraldry of the imperial families of Russia (the House of Romanov (1613-1762)). Use of a double-headed Imperial Eagle, improved from the single-headed Imperial Eagle used in the high medieval period, became current in the 15th to 16th centuries. The double-headed Reichsadler was in the coats of arms of many German cities and aristocratic families in the early modern period. A distinguishing feature of the Holy Roman eagle was that it was often depicted with haloes. After the dissolution of the Holy Roman Empire in 1806, the double-headed eagle was retained by the Austrian Empire, and served also as the coat of arms of the German Confederation. The German states of Schwarzburg-Rudolstadt and Schwarzburg-Sondershausen continued to use the double-headed eagle as well until they were abolished shortly after the First World War, and so did the Free City of Lübeck until it was abolished by the Nazi government in 1937. Austria, which switched to a single-headed eagle after the end of the monarchy, briefly used a double-headed eagle – with haloes – once again when it was a one-party state 1934–1938; this, too, was ended by the Nazi government. 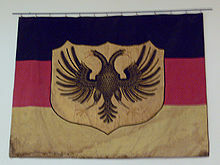 Since then, Germany and Austria, and their respective states, have not used double-headed eagles. The Gandaberunda is a bicephalous bird, not necessarily an eagle but very similar in design to the double-headed eagle used in Western heraldry, used as a symbol by the Wadiyar dynasty of the Kingdom of Mysore from the 16th century. Coins (gold pagoda or gadyana) from the rule of Achyuta Deva Raya (reigned 1529–1542) are thought[by whom?] to be the first to use the Gandaberunda on currency. An early instance of the design is found on a sculpture on the roof of the Rameshwara temple in the temple town of Keladi in Shivamogga. The symbol was in continued use by the Maharaja of Mysore into the modern period, and was adopted as the state symbol of the State of Mysore (now Karnataka) after Indian independence. The Kastrioti family in Albania had a double-headed eagle as their emblem in the 14th and 15th centuries. 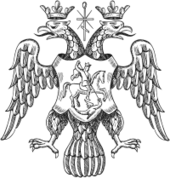 Some members of the Dukagjini family also used double-headed eagles, and a coalition of Albanian states in the 15th century, later called the League of Lezhe, also used the Kastrioti eagle as its flag. The current flag of Albania does feature a black two-headed eagle with a crimson background. The two-headed eagle appears, often as a supporter, on the modern and historical arms and flags of Austria-Hungary, the Kingdom of Yugoslavia, Austria (1934–1938), Albania, Armenia, Montenegro, the Russian Federation, Serbia. It was also used as a charge on the Greek coat of arms for a brief period in 1925–1926. It is also used in the municipal arms of a number of cities in Germany, Netherlands and Serbia, the arms and flag of the city and Province of Toledo, Spain, and the arms of the town of Velletri, Italy. Several sports clubs, mainly Greek and Turkish, have the double-headed eagle in their insignia. Some of them are: two football clubs of Turkey, Erzurumspor and Konyaspor and the Greek sport clubs AEK (Athletic Union of Constantinople) and (since 1929) P.A.O.K. (Panthesalonikios Athletic club of Constantinople). The Greek clubs use this symbol since both were founded by Greek refugees who fled to Greece from Constantinople in the 1920s. It is also the emblem of the Dutch clubs NEC and Vitesse Arnhem, the English football club AFC Wimbledon and Scottish side Saint Johnstone FC. The Gandaberunda insignia is used by the Indian club Bengaluru FC in their logo. ^ a b Reconstructed by the Abegg Stiftung Riggisberg, Switzerland. P. Ackermann: A Gold-woven Byzantine Silk of the Tenth Century. In: Revue des Arts Asiatiques X, 1936, 87-88. D.G. Sheperd: A mediaeval brocade. In: Bulletin of the Cleveland Museum of Arts 37, 1950, 195-196; S. Müller-Christensen: Zwei Seidengewebe als Zeugnisse der Wechselwirkung von Byzanz und Islam. In: Artes Minores. Dank an Werner Abegg. Bern, 1973, 22-25. ^ Stone slab with Double-Headed Eagle, Stara Zagora, Nasionalen Arkheologicheski Muzei, Sofia Inv. nr.B: 854; 10th-11th century, from the time of the Macedonian Empire in Bulgaria (976-1018) or from the time of Byzantine occupation (971-976; 1018-1185) and may be the emblem of rank of the Bulgarian tsar/basileus in Illyricum. Evans, Helen C. & William D. Wixom. Eds. The Glory of Byzantium. Art and Culture of the Middle Byzantine Era A.D. 843-1261. The Metropolitan Museum of Art, New York, 1997. 326f. ^ "It was from the Byzantines, however, that the Turks adopted the double-headed eagle. A royal association with this emblem is suggested by its appearance on the keystone of an arch from the Seljuk citadel at Ikonion. This is made even more explicit by the double-headed eagle emblazoned with the word al-Sultan on a ceramic tile excavated at the palace of Alaeddin Kaykubad at Kubadabad, near Akşehir" Helen C. Evans, William D. Wixom, The Glory of Byzantium: Art and Culture of the Middle Byzantine Era, A.D. 843–1261, Metropolitan Museum of Art (1997), p. 411. ^ "Artuqids of Mardin, Nasir al-Din Mahmud (1200 - 1222 AD), AE Dirhem 26 mm; minted AH 617 (1220/1221 AD) obv: Two-headed eagle. Rev: Three line Kufic legend in beaded border" Tom Buggey, Coins of Islam Archived 2016-05-05 at the Wayback Machine. "B2272. ARTUQUIDS OF HISN KAYFA AND AMID, NASIR AL-DIN-MAHMUD, 1200-1222 AD. AE Dirhem, Spengler/Sayles 15. 12.68 gm. Two headed eagle with wings spread representing the astrological sign Gemini/Legend. Nice VF." Edgar L. Owen, TURKOMAN AND OTHER EARLY WORLD COINS Archived 2016-04-26 at the Wayback Machine. Baldwin Islamic Coin Auction 18 Archived 2016-05-12 at the Wayback Machine nos. 626–629. ^ Pierced Globe (Handwarmer made for Badr al-Din Baysari) c.1270 Archived 2016-05-07 at the Wayback Machine London: British Museum 78 12-30 682. ^ The Cairo Citadel relief is of uncertain origin, and was likely moved to Cairo during the Mamluk period. Nasser Rabbat, "The Visual Milieu of the Counter-Crusade in Syria and Egypt" in: Khalil I. Semaan (ed. ), The Crusades: Other Experiences, Alternate Perspectives: Selected Proceedings from the 32nd Annual CEMERS Conference (2003), p. 76. Its heads are missing, and its design is the origin of the (single-headed) "Eagle of Saladin" introduced as a symbol of Egyptian Republicanism in the 1950s. 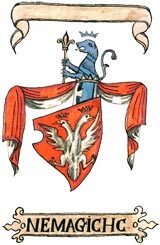 L. A. Meyer, Saracenic Heraldry (1933), p. 195, cited after The Flag Bulletin 24 (1985), p. 44. ^ Atlagić, Marko (2009). "Određivanje nacionalnih heraldičkih simbola na primjeru Srba i Hrvata [Étude des symboles nationaux héraldiques à l' exemple des Serbes et des Croates]" (PDF). Zbornik radova Filozofskog fakulteta u Prištini, no. 39, pp. 179–188. Archived (PDF) from the original on 2015-05-28. ^ Alfred Znamierowski (2003). Illustrated book of Flags. London: Southwater - Annes Publishing Ltd. p. 55. ISBN 1-84215-881-3. ^ Eleni Kokkonis-Lambropoulos & Katerina Korres-Zografos (1997). Greek flags, arms and insignia (Ελληνικές Σημαίες, Σήματα-Εμβλήματα) (in Greek). E. Kokkonis-G. Tsiveriotis. pp. 47, 51. ISBN 960-7795-01-6. ^ A. Davidson, A history of the Holtes of Aston, baronets (1854), p. 69, in a description an armorial frieze dated 1608. ^ "Civic Heraldry, Wimbledon Borough Council". Archived from the original on 10 May 2015. Retrieved 30 May 2015. ^ "Perth and Kinross - Coat of arms". ngw.nl - Heraldry of the World. Archived from the original on 9 October 2012. Retrieved 11 October 2013. ^ Alfred William W. Morant, An alphabetical dictionary of coats of arms belonging to families in Great Britain and Ireland (1874), p. 304. ^ "ＦＸで儲けを得るための手段とは？". scottishritemasons-can.org. Archived from the original on 28 October 2012. Retrieved 3 May 2018. ^ "Atiker Konyaspor – Resmi İnternet Sitesi". www.konyaspor.org.tr. Archived from the original on 30 January 2004. Retrieved 3 May 2018. ^ "History". PAOK F.C. Archived from the original on 13 October 2013. Retrieved 11 October 2013. ^ "Mercian History". Mercian Volunteers Regimental Association. Archived from the original on 2007-09-29. Retrieved 2013-05-13. ^ Urquhart, R. M. (1973). Scottish Burgh and County Heraldry. London: Heraldry Today. pp. 108–109. ISBN 0900455241.
de Vries, Hubert (2011). "Two-Headed Eagle". Hubert Herald. Velde, François (2005). "Heraldry in Byzantine?". Heraldica. "Altar Cloth or Podea (of Paul, Patriarch of Constantinople)". Met Museum. Gallery 303. Accession: 12.104.1.